The purpose of a FM transmitter is to broadcast a signal from a portable device such as a smartphone to a stereo system. 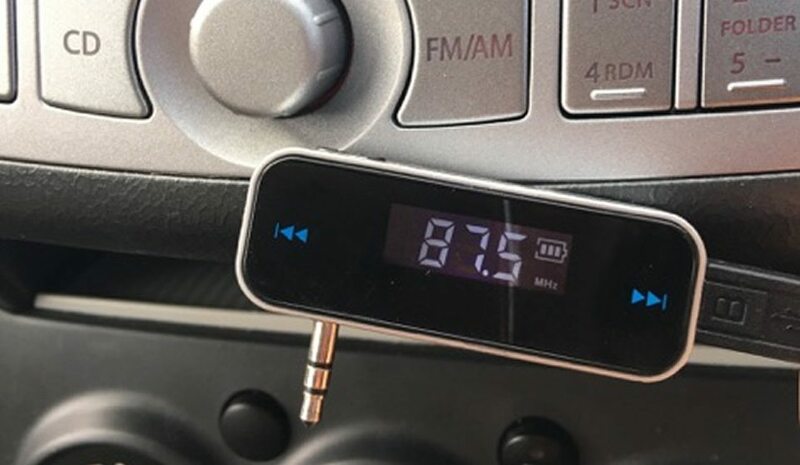 Most FM transmitters will feature Bluetooth that enables a wireless connection to your audio device without the needing an aux cable. The best FM transmitter is the upgraded Nulaxy Bluetooth Transmitter, which has additional functionality such as the sleep or wake mode and four different music playing modes that include Bluetooth, TF Card, AUX and USB. Popularity of FM transmitters has seen a large increase because people simply want to listen to their own music as opposed to the radio. Without a Bluetooth or AUX, USB or TF card stereo, this has not been possible without the use of a transmitter. Using a FM transmitter instead of installing a new head unit is a far more cost effective method of obtaining Bluetooth functionality. It will also work with the majority of smartphones regardless of the operating system they use. It may be tempting to go for a cheap device but spending the little bit extra can see huge benefits. Below is a list of the best FM transmitters that ensure high sound quality and come with a range of features such as USB outlets and hands free calling. The Nulaxy is one of the most popular FM transmitters worldwide and is highly rated for its functionality and aesthetically pleasing design. It also uses the latest Bluetooth 3.0 technology for the fastest and most reliable connection. This is the latest and most powerful Nulaxy model when compared against the much loved 2016 model. The latest version includes additional features such as a sleep/wake mode as well as supporting extra audio playing modes. Overall, the Nulaxy is one of the best Bluetooth FM transmitters and is highly popular worldwide for its functionality at an affordable price. VicTsing is an alternative to the Nulaxy FM transmitter that offers very similar functionalities. From simply inserting this device into the cigarette lighter of your car, you can have the ability to play music via Bluetooth, USB, AUX or TF Card. Both the VicTsing and Nulaxy are very similar in terms of performance and features but the VicTsing is slightly cheaper. For that reason, it is the best FM transmitter for the money and will not disappoint. For those that are looking for something stealthy and compact, the IMDEN FM transmitter is ideal and works right out of the box. It is important to keep in mind that it is primarily for Bluetooth connectivity as there is no AUX input. Overall, it is a great all-rounder that is compatibility with all iOS and Android devices. However, the compact design is the unique selling point of this device and it is great for those with limited space near the cigarette lighter. The LDesign FM transmitter is a completely different style to the rather large alternatives. It is also aimed at those that are on a budget and require multiple methods of listening to their music other than just Bluetooth. The main drawback with the design is that it has a limited display for caller information. However, if this is a key feature, you should opt for the more expensive Nulaxy or VicTsing alternatives. Overall, the LD Design offers excellent value for money and a unique design compared to other FM transmitters. The Gogroove is a premium Bluetooth FM transmitter that allows for 2 devices to be connected simultaneously. As this is a more expensive device compared to the alternatives, it comes with an impressive 3 year warranty for peace of mind. Overall, it is a high performing car FM transmitter with usable features and an intuitive design. However, it is the most expensive device and when you compare it against the likes of the Nulaxy or VicTsing, it may not seem worth paying the extra. However, if a long Gooseneck design is required, then this is by far the best option. Some cigarette lighter ports make it virtually impossible to use a transmitter but the Gooseneck makes things much more easier. Listening to the radio and music that you simply do not want to hear can become very mundane. With a cost effective FM transmitter, you can switch to music streaming of your own music without any wires or complicated setup. However, it is not just audio streaming that a FM transmitter can offer, it can also act as a Bluetooth handsfree car kit for safe and legal phone calls. There are hundreds of different types of transmitters available and many that are cheaper than the ones recommended within this article. However, most of these cheap alternatives use older Bluetooth technology and are not viable options for handsfree calling. On top of this, they often do not offer long warranties. The main purpose of the FM transmitter is to tune into an unused frequency on your stereo and match it to the FM on the device. This is the way music is played through the cars speakers but the quality can be varied across devices. If you have just purchased car speakers for sound quality but are using a cheap FM transmitter, it may output distorted music. Paying the small amount extra for a powerful device such as the Nulaxy is worth the extra. All of our recommendations use Bluetooth for audio streaming but there are other forms of outputting the audio. Other modes include using the USB, TF and AUX input but the simplicity and compatibility with your smartphone make Bluetooth by far the best option for audio streaming. The buttons on available on the interface of the device can make a world of difference. Large hot key buttons that are easy to reach and do not require you to look down can make usability far easier. These buttons will be used for switching between songs and answering calls without the need to touch your phone. The majority of FM transmitters will run from a 12V cigarette lighter. For those that drive older cars and notice that the transmitter is not working, be sure to check the fuse that powers the cigarette lighter. From our research, this seems to be a common issue, which results in so many transmitters being returned. If the fuse is working, check the continuity using an automotive multimeter to see if there is any current running to the cigarette lighter. For those that are using their cigarette lighter for other devices, you could invest into cigarette lighter adapter, which gives you additional sockets. The design of the FM transmitter varies massively and its important that you choose wisely. Not every car is designed to use FM transmitters and they can get in the way. For example, if you drive a manual car and the cigarette lighter is located next to it, there is the potential to hit it whilst changing gears. If this is the case, we highly recommend choosing a gooseneck design so that you can angle the bulk of the device away from the gear stick. You could also choose a compact device such as the IMDEN device, which will be barely noticeable. Large displays are also very desirable because they are able to output signal strength, voltage, audio and caller ID information. Those that are smaller will simply display just the frequency. FM transmitters are one of the best inventions in the car audio industry but there is one main drawback. If you travel long distances, the FM station that you choose may reach another radio station that would not be present in your local area. This may interrupt with your audio streaming and become frustrating when travelling far distances as you may find yourself switching FM stations quite frequently. If you cannot afford a new head unit with various audio inputs, then a FM transmitter is your best option. They are cost effective, easy to use and compatible with virtually all devices. All of our recommendations are able to play music via Bluetooth but some also offer AUX, USB and TF card alternatives. Can these Bluetooth transmitters be used in a with 15-18 yr OEM radio with no Bluetooth capability (only AM, FM, CD & Cassette Tape). I recognize music transfer would be via unused FM channel and in my case, a USB flash drive? Is music quality good using this approach (don’t have smartphone)? Hey Michael – Yep these will work. They connect via the radio frequencies and I use it with my OEM radio in a 1988 Mercedes if that helps. With regards to having no smartphone, the ones with USB will be able to do this but you may need to format the USB to work with a FAT32 file type.